Spotlight? Check! Best friends? Check! Bringing the fire and desire? CHECK! Also, their band’s name is Excuzed Absence which is one of the most clever middle school band names ever. Let’s start with the keyboardist who probably gets the least love in this home video but is surely keeping this cover alive. He has the song down pat. Next is the guitarist who is looking Metal as heck and jamming with intense concentration- even after he covers his face from the spotlight. Then, we have the bassist who definitely delivers the show-man quality of Journey with his here and there air kicks. But what is “Don’t Stop Believing” without those impressive vocal runs? Guess who’s on the main mic… the drummer! In actuality, he can sing well and deserves the illuminating spotlight. Although, he might be better suited as a front-man than a drummer, it is quite difficult to sing and play an instrument all at once. 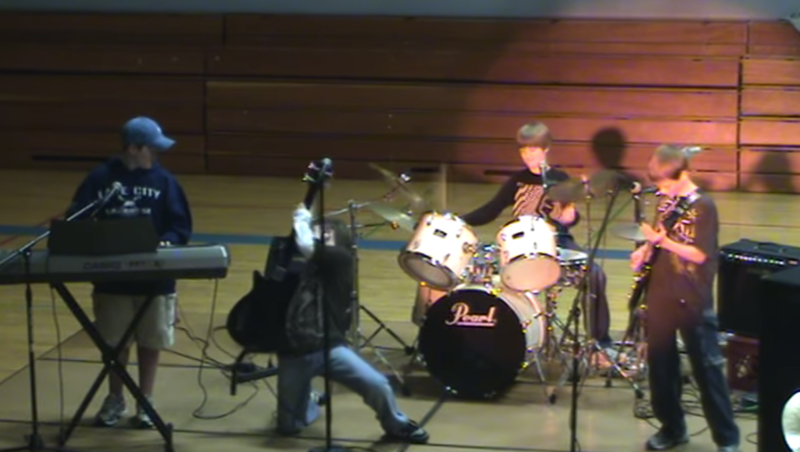 All together, Excuzed Absence better have won their 7th grade talent show because the totally won my heart. These are the kind of underdogs in middle school that end up having everyone swooning over them or begging for jam sessions during lunch break. You can tell their prior practice must have been the best time ever. They probably alternated who would sing the vocals a few times before they realized that their drummer could best imitate original Journey singer, Steve Perry. “Don’t Stop Believing” is a classic rock anthem that reminds us of love and hope for the future- which are intense emotions that maybe aren’t quite comprehensible in 7th grade. Despite the slight complexity of the feelings behind the song, Excuzed Absence still makes you feel some kind of way- and that’s what rock is all about. Their school mates definitely had a good time with a little dancing behind the stage and an audibly sincere applause from the crowd in front of them. You rock don’t ever change, my dudes!